After the 2018 Grammy Awards, Rita Ora has continued to make the rounds in New York City, stopping by the SiriusXM Studios on Wednesday (January 31) as well as ‘The Tonight Show Starring Jimmy Fallon’ where she also took to the stage with Liam Payne for the first performance of the new ‘Fifty Shades Freed’ track, ‘For You’. 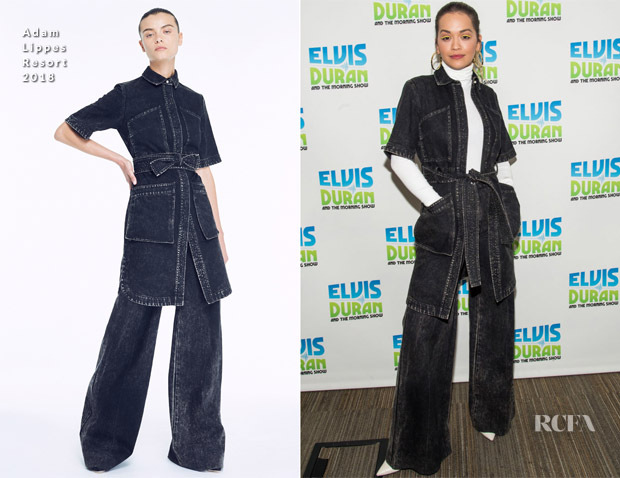 SiriusXM: The songstress brought such a sleek interpretation of urban appeal to these Adam Lippes Resort 2018 denim-inspired separates. I love how she infused the look with her own personality in the white turtleneck and pumps topped with hoops and a slick of bold yellow eyeliner. ‘The Tonight Show Starring Jimmy Fallon’: This Nicolas Jebran Fall 2018 Couture design was a playful take on the iconic tux and tails, and there would be no doubt that Rita worked the flirty frock it to her advantage. 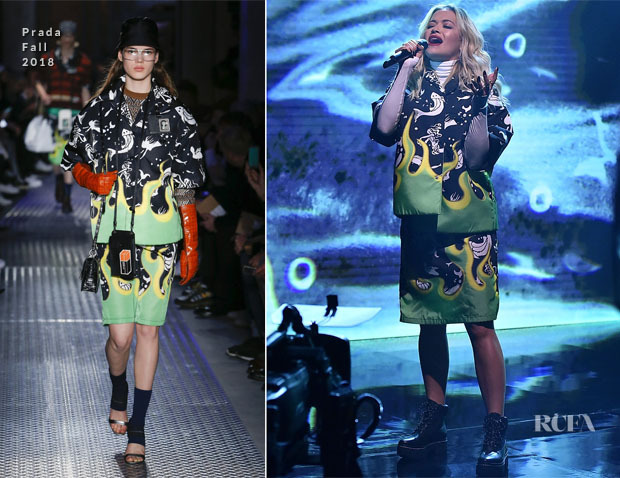 ‘The Tonight Show Starring Jimmy Fallon’ Performance: Snagging a look that featured in the Prada Fall 2018 menswear collection, Rita rocked these separates that featured a mishmash of signature Prada prints, including the flame motif, yielding a super-artsy appeal. Her lug-sole boots referenced a workwear-style approach likewise seen in this collection, however, she skipped the red gloves in favour of that white turtleneck. 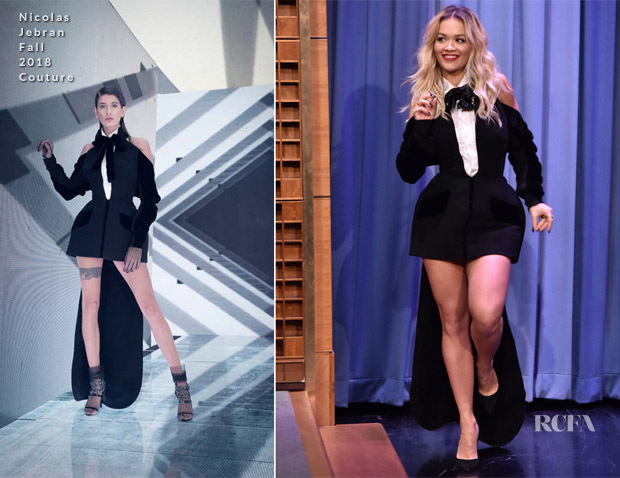 It’s not exactly what I would have guessed Rita would wear for this performance, but it made for an intriguing, statement look, as she always keeps us on our toes with her style.